We cook with garlic almost every day. Did you know that garlic is simple to grow and so delicious when picked right from your yard? It is! The hardest part of growing garlic is that you must plan ahead. 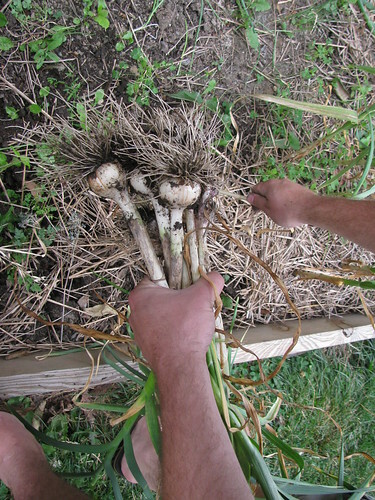 Garlic needs to be planted in the fall, overwintered in the ground, and then harvested in mid summer. 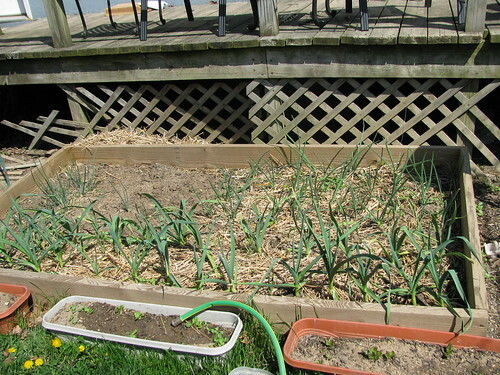 To grow garlic, first you need a space in the garden. Garlic only needs to be spaced about two inches apart, so you can have a good harvest in a small area if you don't have an expanse of beds. Garlic does best with full sun in well turned soil. Next, you need seed garlic. The simplest, cheapest way to get these is to buy organic garlic from the grocery store and plant the individual cloves. The risk in planting grocery store garlic is that you have less control over the variety and if the garlic has not been stored properly it might not grow. Local nurseries sometimes carry seed garlic. Be sure to call ahead, as the dates when garlic arrives vary by location. 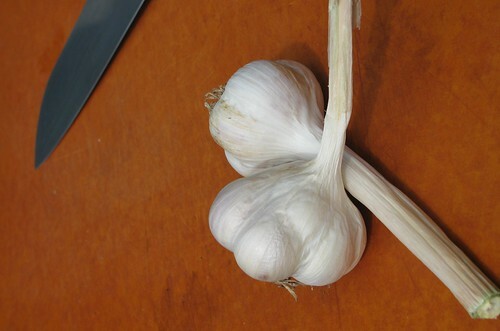 This year we are ordering from thegarlicstore.com because we want to try some of the unique varieties they offer. In Ohio, hardneck varieties grow best and store best, so that is what we recommend. Plant your cloves in early fall. For Ohio, you can plant anytime in the fall through early winter. Our biggest lesson learned last year is that spacing can be tight. Just leave enough space for a head to grow between each clove. The cloves will overwinter with no visible growth. They need the cold temperatures to signal side buds to grow. As spring warms the ground, those side buds will develop into cloves. 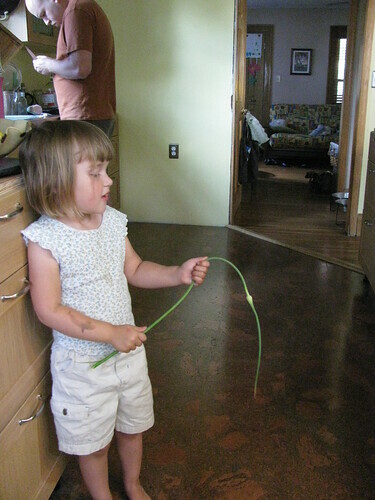 The garlic will send out tall shoots over the soil. In late spring or early summer, a garlic scape will develop. This strangely shaped growth will develop into a flower, but is it best picked off to allow the garlic to develop into cloves. The scape has a rough texture but tastes like mild garlic or strong chives and is delicious in stir fry or salad. When the shoots finally start to turn brown and droop, it is time to harvest your garlic. Pick one plant to make sure it is well developed. When you like the size of the bulbs, pick all the plants. Allow to dry in open air. After a few days, remove the shoots from the top leaving at least a few inches of the hardneck. Scuff off the roots and outer sheath. Store your harvest in a cool (around 50 deg F), dry, well ventilated place. Garlic is deliciously milky and soft when it is young and will turn more pungent as time passes.